I like work during the weekend. I found that sometimes after working during a weekend, I feel happy and motivated, and sometimes I feel bad and tired. The funny thing is that I can get the same amount of work done in both cases. Thus, I tried to find what the difference was between bad and good weekends for me. If you are working, it’s great to know that you do your work. We all know how good it feels to accomplish something. However, it’s hard to finish big tasks in a short period of time. I found that the main difference in my bad and good feelings during the weekends was the sense of doing what I wanted. Break your indomitable task into smaller goals. Notice and enjoy the sense of satisfaction and your shot of dopamine! I didn’t have this blog post on my to-do list. I felt bad about that, so I am adding it now. I crossed it off, and now I feel motivated for the next blog post. 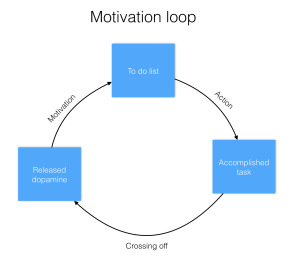 Maybe I should write about my techniques for getting things done?